Microsoft is now testing new cumulative update build 14393.1184 for PC and mobile build 10.0.14393.1184. 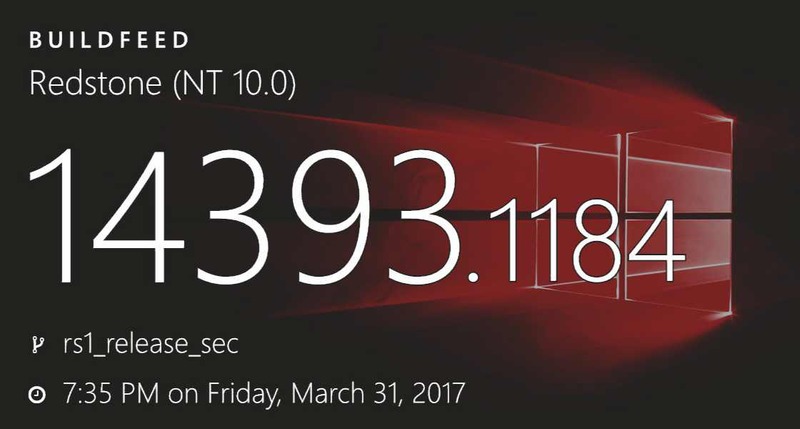 The upcoming Windows 10 Anniversary Update build 14393.1184 were compiled on March 31, 2017. Last month, Microsoft released a couple of updates including KB4013429 (build 14393.953), KB4015438 (build 14393.969), and KB4016635 (build 14393.970) for Anniversary Update users. Also, Microsoft’s Creators Update for Windows 10 will release on April 11. In addition, the company will also allow users to manually download the update with the help of Windows 10 Update Assistant starting April 5. Microsoft also confirms Windows 10 Mobile Creators Update roll out on April 25. However, if you can’t wait for that long, download the update from the link below.